Here are just some of the common products that can be finished on our line of foil stamping, embossing & diecutting presses. Size formats range from as small as 3″ x 3″ on our EHD Series Press up to 37″ x 51″ on our V-13 Series Press. Contact us for details on your specific product/equipment combination. Those products that are linked feature video or photo representations of the product. Since the early 1980’s when hologram technology progressed to foil stamping machines, the use for holograms has become more and more wide spread. Today the hologram has a whole range of uses from security tags to packaging, book covers and advertising. The video here demonstrates registering a hologram as part of a seven pass colorful foil/hologram display card. Read on to learn more about Kluge’s hologram registration technology and capabilities.The Kluge Hologram Registration Unit is built onto the Electronic Foil Control System, Low Mount. It enables you to accurately register holograms using your Kluge press. Note: the hologram registration unit is not compatible with the mechanical foil control system. Hologram Registration Unit set up on an etched toggle base. 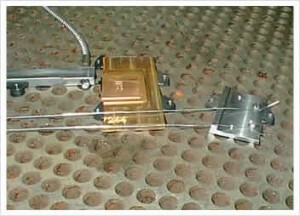 This image shows fiber optic sensor, wire guides, die and foil to the center of the toggle base. The Hologram Registration Unit utilizes fiber optic technology as the hologram registration mark detection system. The fiber optic sensor is mounted to the toggle base in line with the edge of the foil. The sensor is connected to the signal pick up device, also known as the ‘amplifier’ which is then electronically adjusted until the registration mark can be seen. This innovative system allows you to digitally align hologram foil on the die with registration accuracy of +/- .012″. Two #30 gauge wire guides are positioned on the toggle base just below the die, one is placed under the foil and the other is placed over the foil. These wire guides effectively prevent the hologram foil from curling as it is fed through the machine (see photo). Close-up view of the die area showing fiber optic sensor, die and guide wires. Easy access to the configuration and controls of the Hologram Registration Unit is made available from the touch screen control system. Kluge has developed a “User Guide to Hologram Stamping”. Click here to download your free copy and learn about everything from history, to foil types to the technology involved in producing quality holograms. Kluge 14 x 22 Presses do not have enough platen space to die cut regular format pocket folders (learn about our EHG Series Press, designed to meet the need for diecutting pocket folders on a Kluge format press). However, Kluge feeders are designed in such a way that an over-sized sheet can be fed into the machine and stamped or embossed within the 14 x 22 platen area. 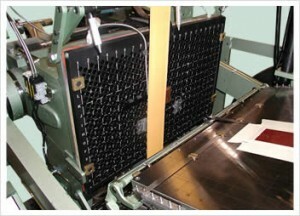 Here, a pocket folder is fed into an EHD Series Press for foil stamping. Although the sheet size exceeds the maximum sheet length (at 16 inches), the image area remains within the 14 x 22 inch finishing space. This makes foil stamping the pocket folder possible. A variety of stock-types can be finished on a Kluge Press. These include certain plastics, card stock, thin paper stock, labels etc. The video here demonstrates foil stamping a bible cover product on flexible synthetic leather. The production is greatly increased by use of our preload magazine for continuous feeding, where stock is loaded into the rear of the magazine while the press is in motion. The Kluge WFE is our only web-flow press in production today. It is capable of high speed foil stamping and embossing. Here, the press is operating at a speed of 8,000 iph to register holograms for a security product. Contact us for more information about registering holograms. See our “Users Guide to Hologram Stamping“. A demonstration of the EHG Series Press diecutting reinforced book covers. The press is operating at non-production speed. True production speed is approximately 1,700 iph. By design all of our platen format, sheet-fed presses are capable of feeding irregular shaped stock and can be configured to feed “multiple-up” sheets. With a small supply of additional accessories, this method enables smaller jobs to be fed two sheets at a time, thereby doubling production speed. Other uses for the two-up attachment include: Run pass one of a two pass job on one side of the machine while pass two is run on the opposite side of the platen OR skilled operators could set up two unique jobs to run simultaneously on the press! Imagine the time savings you could enjoy here. The video demonstration here shows foil stamping and embossing two-up playing card boxes on our EHF Series Press. By design all of our platen format, sheet-fed presses are cabable of feeding irregular shaped stock and can be configured to feed “multiple-up” sheets. With a small supply of additional accessories, this method enables smaller jobs to be fed two sheets at a time, thereby doubling production speed. 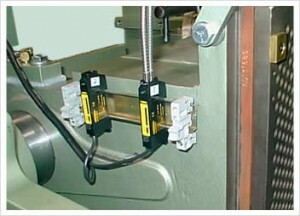 Other uses for the two-up attachment include: Run pass one of a two pass job on one side of the machine while pass two is run on the opposite side of the platen (shown here) OR skilled operators could set up two unique jobs to run simultaneously on the press! Imagine the time savings you could enjoy here. The video demonstration here shows foil stamping and embossing two-up CD wallets (pass one and pass two) on our EHF Series Press. A demonstration of the EHG Series Press foil stamping and embossing a 20″ x 28″ poster. This “fish poster” used 6 combination dies and 5 streams of foil. A variety of materials and thicknesses can be finished on Kluge presses. The stock thickness range is from onion skin to paperboard (.20″). In this video we demonstrate feeding both thick and very thin stock.